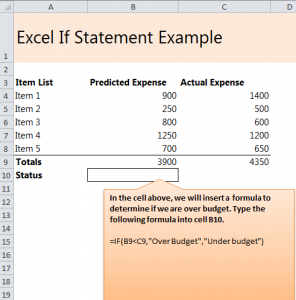 The Excel If Statement formula is very valuable when doing math within Excel. It is most often used when you have a large amount of numbers and need to decide the status and outcome of each group. The “If Then” formula will explain to you, automatically, that is IF something is bigger/smaller/etc THEN the answer is bigger/smaller/etc. To discover what number or sum is larger, smaller, or more valuable than another. When one category is doing better than another category. How total amounts compare to each other. Download our “If Then” formula example and follow along to learn this valuable tool. In the spreadsheet, there are 5 items in a list, each with an estimated expense and then their actual cost. This is what will determine your difference in the formula. Since 3,900 is less than 4,350, the status bar will state “Over Budget” because it can see that C9 cell us larger than cell B9. You have now completed the formula and received your results. Just slightly changing the formula will help you to fit it within your own work projects. Type in the cells to fit whatever two cells you are trying to calculate. Instead of C9 and B9, choose the cells that contain your totals. Changing the < or > sign will determine number status. “Over Budget” and “Under Budget” just need to be replaced with whatever words you desire. Play with the example to learn different ways to use the “If Then” formula before using it on any of your own spreadsheets. This way you can become quicker and more comfortable with using the formula on your own, without a guide.